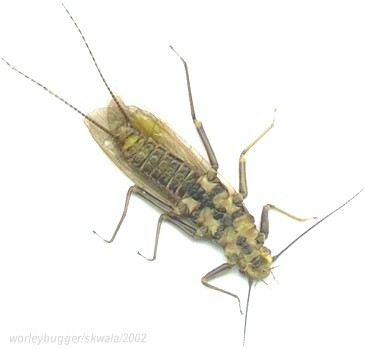 Contrary to popular belief and what has been written in books, magazines as well as portrayed by area guides for years, the Skwala Stonefly makes an emergence on the Yakima river in early spring. Many fly fishermen and guides had thought for years that this was a Golden Stone species. Just recently have they come around to correctly identify this early spring Stonefly. When I first began fishing the Yakima in the mid 1980's the chatter with area fly fishermen always revolved around a Golden Stone hatch that appear on the waters of the Yakima sometime during the month of February. To me it seem a bit early to see a Golden Stone species. However, it seemed entirely possible since the Central Washington climate and conditions were much warmer than I was use to seeing at that time of year. The Montana rivers I grew up fishing hadn't produced a Golden Stone until the early summer months. After close examination of a Yakima species by a University of Davis entomologist and close family friend, this early spring stonefly was correctly identified as the Skwala Stonefly. This size 8-10 Stonefly sets the motion for great spring time dry fly fishing. There are vast numbers of the Skwala Stone-flies in the Yakima and you will begin to see them in late February. Their are special patterns for imitating the Skwala and you can find the best one's in our fly shop in Ellensburg. Most of our patterns were produced by Montana fly tyers replicating the Bitterroot River Skwala Stone. "For early season fishing this Stone-Fly can provide anglers that have found themselves with the winter fly-fishing blues plenty of dry fly excitement. Water and weather temperatures are usually very mild and the Yakima's bigger trout are hungry and on the prowl. We begin to see the Skwala emergence when the water temp reach's 45 degree's, but this smaller olive bodied stone tend to hatch in great abundance when the water reaches 47. A great time to be on the Yakima!". 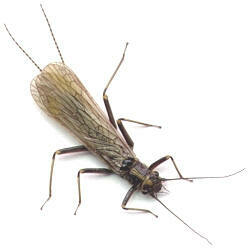 This Stonefly is common in creeks and rivers throughout the west. The Skwala Stone can be found in California, Colorado, Idaho, Montana, New Mexico, Nevada, Oregon, Utah, Washington, and Wyoming. There size will range from 8 to16mm and there normal emergence period begins around the middle of February. Water temperature is a key factor in there emergence. It must be in the middle to middle to high 40's before we begin to see them emerging in great numbers. The afternoon and evenings are the best times to see this stonefly.